Linda Brown, Cheryl McCloud and Linda Keely stand with their horses while giraffes roam behind them. Did you ever yearn to live like they did in the movie “Out of Africa” with Meryl Streep and Robert Redford? Meryl played Baroness Karen von Blixen-Finecke, a Danish aristocrat with a large coffee estate in Africa that employed several native servants. 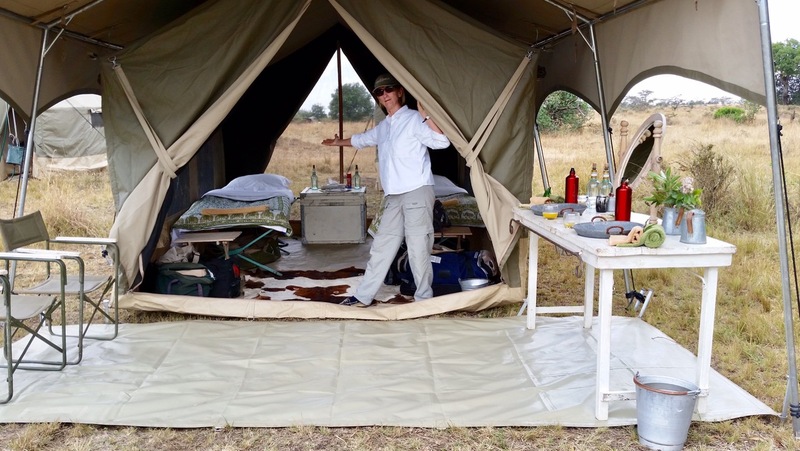 When she went on safari in the bush, she lived just as elegantly in a tent as in her beautiful home. Now, you can do that, too. A giraffe poses for the camera. There are a variety of safari outfitters in Africa, offering different options for seeing the land and wild animals, and safaris on horseback are a favorite among those who ride. Some people have told stories of galloping madly across the African plains. Others are thrilled enough just to see the plethora of wildlife and perhaps canter alongside gazelles at a less frantic pace. 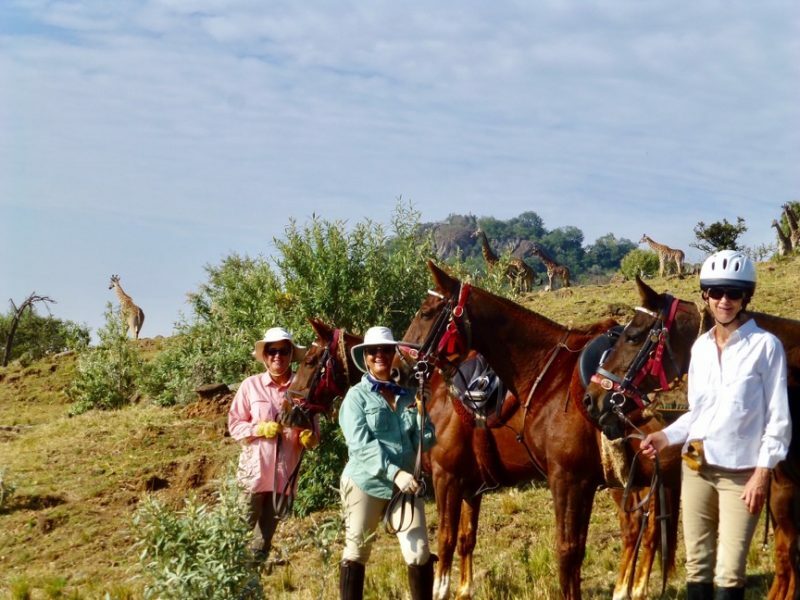 Linda went on her first riding safari in 2010 with some foxhunt friends, and promised herself that she’d go back and do it again. Impressed with Safaris Unlimited outfitters on their first trip, Linda and her friends unanimously chose to book with them again, and weren’t disappointed. 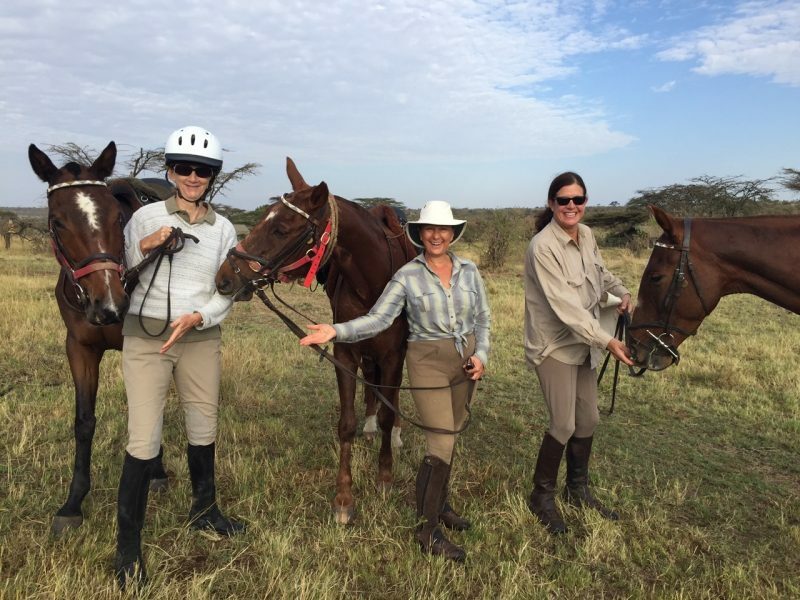 Linda said, “The horses at Safaris Unlimited are so well trained and so well behaved you feel totally safe — totally taken care of.” They chose the Masai Mara ride, which goes through rolling savannah, acacia woodlands and forests on the banks of the Mara and Olare Orok rivers. It’s an extension of the Serengeti ecosystem and Kenya’s most impressive wildlife sanctuary. 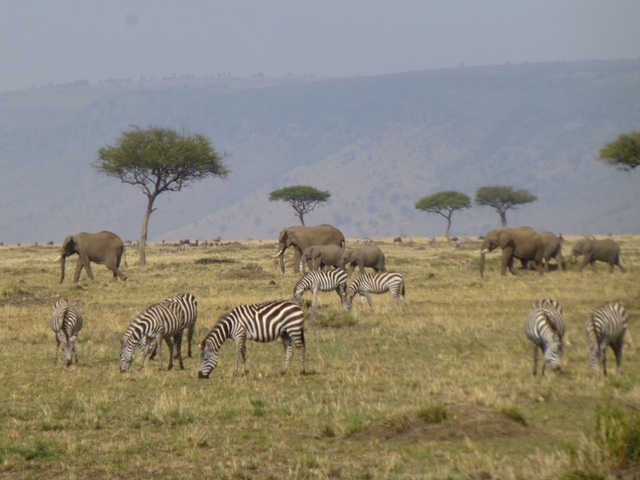 The area is also home to the Masai people, who herd livestock across the region. Linda and her companions riding toward the wildebeest. Safaris Unlimited is a family business that’s the oldest and most experienced riding outfitter in Africa. It was started in 1971 by Tony Church, whose idea of a true African safari was sleeping under canvas tents away from the beaten path. Much has remained constant through the years of operation. Tony spoke of his Masai employees when he said, “Masilia, my trusted headman, joined me in 1971. 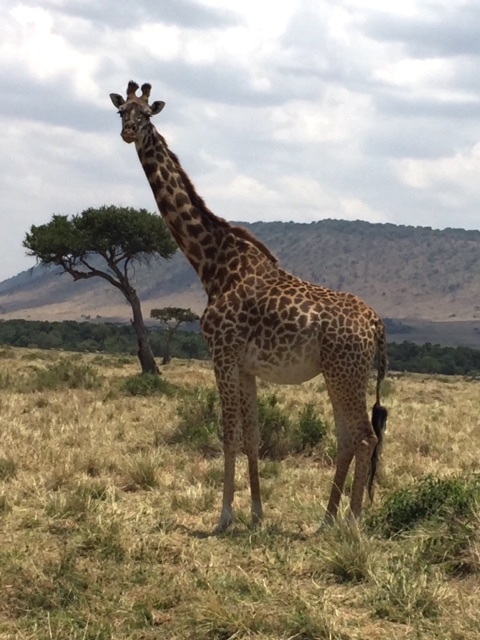 Today his three sons work with the camp crew.” After earning a degree in wildlife management from the Royal Agricultural College in England, Tony’s son Gordie returned to Kenya and took over the business in 2001. 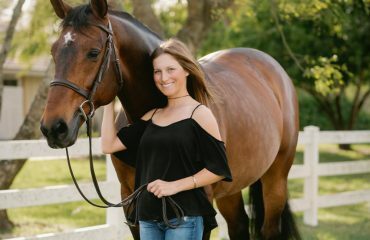 Gordie’s wife, Felicia, specializes in the training and management of their horses. 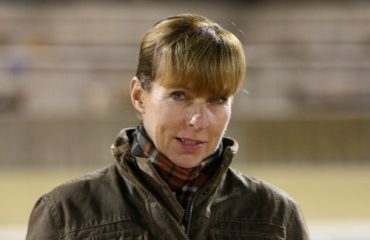 She began to acquire her skills growing up in a family that bred polo ponies in Leicestershire, England, where she hunted regularly with the famous hunts in the area. Horses aren’t routinely imported into Africa because of the expense and the threat of African horse fever, which limits the supply. 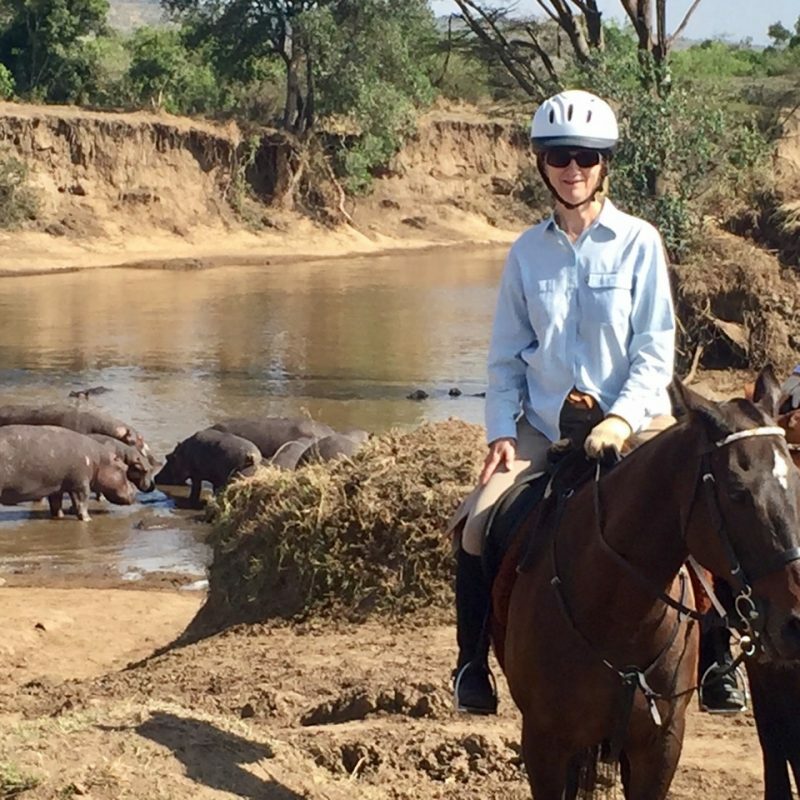 Linda on her horse with hippos behind her. The safari is far from being a boring, sedate experience, however. 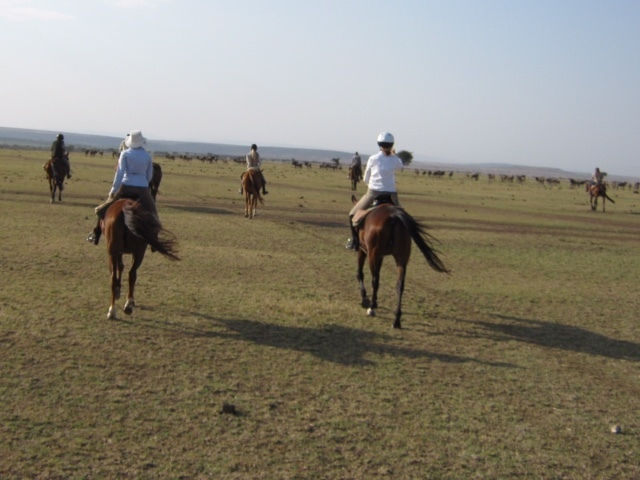 Gallops alongside of migrating wildebeest and gazelle are common for those who wish to take part. Gordie is very familiar with the area and knows just where to lead the group for the best wildlife sightings. They also offer the option of riding in a truck, which is especially good for closer sightings of the big cats. The table set for dinner complete with origami bird napkins. On all day rides where the camp moves and sets up in a different location, lunches are picnics in the bush. Sandwiches are made with bread freshly baked in the charcoal camp ovens and eaten from china, never paper plates. The horses are untacked, groomed and allowed to graze under supervision as guests enjoy lunch and rest. 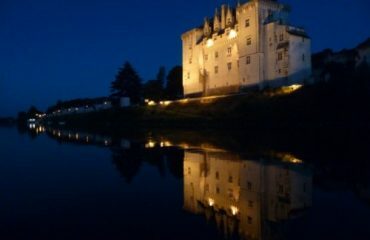 The location is left just as it was found with care to remove any evidence of human occupation. They are very ecologically responsible. The ladies and their horses get ready to ride. As the sun sinks lower in the sky, the smell of a wood fire is in the air and the tents of camp are a welcome sight. The syches (grooms) meet the riders, bringing a bucket of carrots riders can feed their horses as a thank you before they’re whisked away to be untacked and fed. 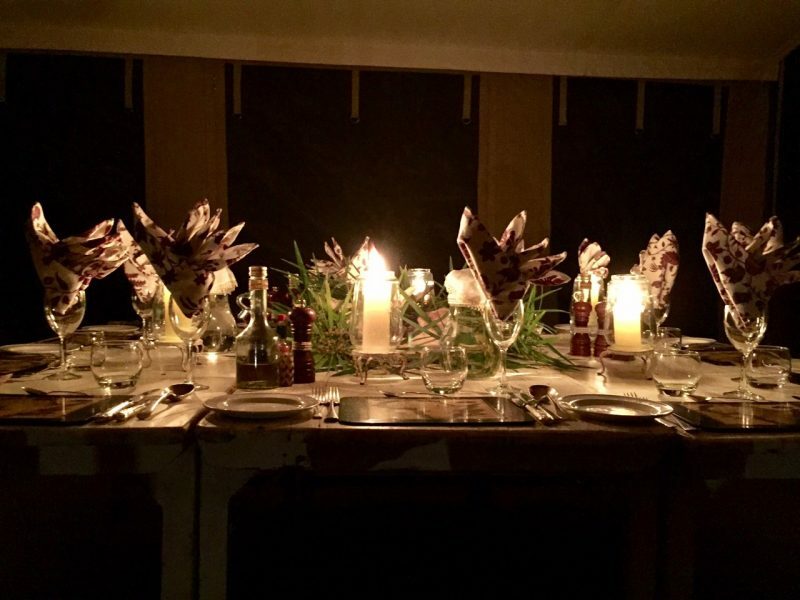 “Sundowners” or cocktails and canapes await, to be savored around the campfire with laughter and conversations about the day before dressing for dinner. Each bedroom tent has its own “bathroom,” a separate tent complete with shower rigged up with an overhead bucket-type arrangement. “You’re not roughing it; it’s all very nice,” Linda explained. “For nighttime trips to your bathroom, your bedside table comes equipped with a flashlight with solar lamps that charge during the daytime. At night, 1920s-style hurricane lamps sit in the covered area just outside your bedroom tent where there’s a mirror and vanity table.” Fires burn around the perimeter of the camp, watched all night by Masai men for safety. Each tent has a double or two twin beds luxuriously made up with Egyptian cotton sheets and duvets. Bedside tables and rugs on the floor complete the furnishings. “When you go to bed, they’ve turned down your bed and put a hot water bottle down by your feet,” Linda said. “You aren’t freezing; it’s probably in the upper 50s and the weather is pretty perfect. For more information, visit www.safarisunlimited.com.